One benefit of writing this blog is that it gives me an excuse to sit down and talk with our rabbis at much greater length than I normally would. This is the first in an occasional series of interviews with the rabbis of Temple Sinai, my Reform congregation in Oakland, Calif.
My favorite image of Rabbi Jacqueline Mates-Muchin comes from the end of a Friday evening service when her four-year-old daughter — a miniature replica of herself, like the pint-sized Archie and Veronica in those old Little Archies comic books — comes rushing up onto the bima in a pink tutu. 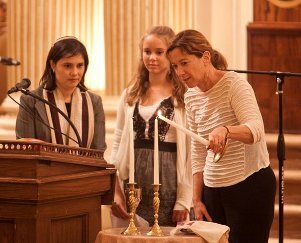 Rabbi Mates-Muchin has been the associate rabbi at Temple Sinai in Oakland since 2005. She didn’t set out to be a congregational rabbi. Fascinated by how people choose to make sense of the world, she initially planned to get a PhD after rabbinical school and become a scholar of religion. But she gradually realized that she relished the congregational role. In our conversation, Rabbi Mates-Muchin spoke about her views of God, death, and the “box” that congregants often expect their rabbis to fill — and the ways in which she doesn’t quite fit that box. Q: Let me jump right into the middle of things. Do you believe in God, and what is your conception of God? A: I believe that there is a oneness to the universe and a connection to every aspect of the universe. The things that make up our bodies are the same things floating out in space. It’s the same stuff that was there at the big bang and the same stuff that will be there when our sun explodes, however many billions of years from now. And ultimately what we do has an effect around the universe. By virtue of that connection, I believe we are commanded to behave in certain ways — in particular with other human beings, but with the world around us as well. That’s why within a Jewish context, the notion of “command” makes so much sense. It’s that idea that there is no other choice. When we understand what our actions mean, how can there be any other choice than for us but to behave in a certain way? Q: With that idea of God as the oneness of the universe, how do you then make sense of the Torah’s portrayal of God as an actual consciousness that communicates with people? A: I think the Torah is a great story. It’s mythology like any other myth. What we learn from it is that there is a separateness that we have to be responsible to. It is on the one hand everything, but on the other hand it is so separate that we cannot mistake it for ourselves. That is ultimately what the Torah teaches by offering the picture of God that it does – to create that analogy so we understand what the separateness is, and how we have to be responsible to that. Visualizing God working in the same way we see people working was a way to help people with the notion of “it’s not all me.” The problem with talking about everything being connected is that we can mistake the things we want with Godness. But that’s not what it (Godness) is. It has to be something more elevated and loftier than any one piece of our reality. Q: So when you’re reading a part where God is speaking through a prophet – Moses, Jeremiah – what do you make of that? Is it the person’s conscience speaking, which they call God? Or is there something that was actually channeled through them? A: It is a person. We all use God-talk to motivate people in different ways. You can use it responsibly. You can use it irresponsibly too. I imagine the prophets believed things about how we have to respond to the world, and told the story in such a way that people could hear it. Q: So do you read the words of a Jeremiah as the words of a human making something up, or a human channeling oneness? A: I would say it’s an inner struggle with … how to encourage people to create a society that is going to be positive and productive. Each of those prophets is having an inner struggle that is very painful, and is also attempting to call up aspects of tradition and text to determine what is the best course of action. You can say it is a human being responding to God’s command, in that it is a human being recognizing that ultimate connectedness of everything and attempting to get other people to recognize it and respond in a responsible and positive way. Q: You’re saying the concept of God is useful as a way for people to understand the oneness that’s outside of themselves. Is there a point at which it also becomes limiting, and the metaphorical parts of God get taken as too real? When people think of God as having hands and arms and a face — the old white man with a beard – does the concept become more limiting than enabling? A: In a lot of ways, yes. That’s why so many people fall out of Judaism and its traditional institutions. They think of that kind of God and it’s far too limiting. It’s problematic because of the gender piece as well. Judith Plaskow talks about it: As long as God is considered male, we are going to mimic that hierarchy here. People say that we tell these stories because that’s how kids understand things, so we need to be concrete. But you can give kids a little more too. You can tell those stories but, from early on, hint that there is also flexibility in the idea of God. That a lot of the flexibility will come from them – what makes sense to them and what makes them feel good. Q: What do you think happens after death? A: I don’t know. To me, that’s the most honest answer. There are things that I hope. Every idea about death is either what we’re hoping for, or what we’re really afraid of. I have a feeling it’s probably nothing. But I don’t know. Q: Is it difficult to minister to congregants with a different idea of God or an afterlife? For instance, what if you’re counseling someone who’s just lost her husband and really wants to believe he is waiting for her in a world-to-come? Or someone who believes in a God who intervenes to get him a promotion at work? A: The concept of God and reality has got to be an individual thing. It is how you understand the way that you are supposed to function throughout life. I can’t say it has to be my way. Most of the time it doesn’t matter what it is, as long as you have some concept that grounds you. The only problem comes when your concept infringes on and hurts other people. It’s about trying to understand what grounds you, how life works and what our purpose is – to me, that’s what religion is. My concept is what grounds and centers me. Believing that I am not any more significant than the particles floating in the sky actually comforts me more than it would (to believe that) that God is paying attention to my every move. That’s how I have to see the world in order to function appropriately. The tricky part is when we use the word God, we all have a different concept of what that word is…. When I talk about God, people probably assume I’m talking about something very different from what I am actually talking about. That’s okay, because the God concept serves the same purpose in people’s lives even if their concept is very different. Q: One question I was going to ask was about evil. If there is a God, how can God allow random evil? But it sounds like from your conception, that’s not an issue because God is not an actor or director, not a “puppeteer God,” and the universe is just unfolding according to scientific principles. A: I think evil is the rejection of those commands to behave in a way that is positive. To have some kind of puppeteer would suggest that nothing is good or evil because there is no choice involved. Ritual and discipline would be unnecessary if people didn’t have (the freedom to choose between) positive and negative tendencies. In Judaism, it doesn’t matter what your thoughts are: It matters what you do. If you have thoughts of hurting people but don’t act on it, that is a very strong measure of your character because you have recognized the difference between (positive and negative) human tendencies and the way we should behave to be a positive influence on the world. Q: Let’s shift back to being a rabbi. What has been your biggest surprise in being a congregational rabbi? A: That’s hard to say. When you start in a new place, the adjustment can be difficult, for the rabbi and for the community. Some people are really excited, and others are frustrated and even angry that they have to get to know somebody new. It is such a disruption within the community that it’s hard to become part of the community. Q: How long has it taken you to feel a part of the Temple Sinai community? A: I think it takes a good two years. I’ve started in a new place twice now, and it’s such an interesting situation to be in. Coming in, most people want to have very positive feelings about the rabbi. Either you behave in such way that you support those positive feelings or you destroy what people’s image is, and that becomes a problem. You are trying to work with people’s concepts of a rabbi. Q: Do you feel like there’s a preconception, a box that people want to put you in? A: The box is that I am expected to be what people would call “very religious.” Whether it’s keeping kosher, or celebrating certain holidays, or fasting on Tisha B’Av, they expect me to be more “religious” than they are. People assume things about how I think about God, or that I believe God wrote the Torah. There are some people who are really disappointed when I don’t fit the box. And there are people who are relieved when I don’t..
And I don’t fit into that box at all. Although there were times in my life when I kept kosher, I don’t now. My husband, who grew up as a Conservative Jew, does and I don’t. So I always joke that he’s the religious one. But it is interesting. Even in the context of this conversation. What do I want to reveal about what I really think, and how is that how going to hurt our relationship, and how I can give you something of the tradition in a way that’s positive for you? I don’t know that it was surprising , but it’s the hardest part – gauging at what point it’s okay for me to talk about what I think. A: Sometimes. I think with the “God thing” especially. Only recently have I found a way to articulate it that I’m really comfortable with, and for the longest time I was just creating something that I thought would work for other people. People would say “What’s your concept of God?” and I’d throw something out that would answer their question well enough, so they wouldn’t think I was some kind of heretic. And because of the box, everyone assumed that’s what it would be anyway. Q: I fall into the exact assumptions you’re talking about – I was surprised to hear your “cosmic” concept, which is actually really close to my concept. The most spiritual book I’ve ever read is Bill Bryson’s “A Short History of Nearly Everything.” He explains all the elements and conditions that went into making the galaxy, and the big bang, and organic life, and you come away with a sense of what an unlikely miracle it is that we are able to exist on this planet. To me, that is holy. That is the miracle, that this all came together and here we are. But that’s not what you expect to hear from a rabbi. Even a Reform rabbi. A: My parents are doctors, and I am sure their scientific way of looking at the world had a huge influence on me. Science helps us describe the nature of the universe, and religion helps to give us purpose. It seems to me they are both necessary and they work very well together. A: Being Jewish is about what you do. And what we are doing is forwarding the tradition of this particular people, the Jewish people. This particular way of life means that we do certain kinds of things. There are also a lot of emotional pieces, such as family traditions and history. It gives us that sense of belonging. But there’s nothing more Jewish about the universe than from any other tradition. Our texts say we are the chosen people because we wrote them. If you look at the texts of any people, they say the same thing. They might not use the word ‘chosen’ but they say the same thing. We are choosing a particular way of life (and) of course we’re going to want to pass down the sense that this is the right way to live. I think every people has that. A: If it were my own kids, I would talk about our family, and family history. With other kids, I would ask if there are things about other traditions that are drawing them in. And I’d ask what their parents say. And what are the things about Judaism that have been positive or negative for them. I would want to help them explore what they are looking for and why they may not have found it in Judaism. It breaks my heart that kids want to leave, because I do think it’s a rich tradition with a lot to offer to the world and to people in the community. But the truth is, everybody has to have that feeling of centeredness – and for the individual, however you get it is the most important path to follow. I feel a pull between wanting to encourage that one particular person to follow a path that feels right, and at the same time a responsibility to Judaism. Sometimes I struggle with whether I’m doing a disservice in teaching Judaism the way that I do – in looking at the bigger picture, or not talking about Judaism in the particular ‘chosen’ way, or saying that there is nothing necessarily more true about our texts. For instance, when I talk about Torah being the result of a lot of political negotiations (rather than the literal word of God), is that doing a disservice to Judaism ? Or in the end will Judaism live further in some places because people have an opportunity to see it in a way that makes more sense to them? This entry was posted on November 18, 2010 at 8:33 am and is filed under Belief (or not) in God, Judaism, Rabbi Interviews. You can follow any responses to this entry through the RSS 2.0 feed. You can leave a response, or trackback from your own site. A wonderful and illuminating talk. Thanks for sharing it. Tom, you are one fast reader!! Yes, thanks for sharing this, Ilana. A very nice interview on your part as well. I admire the Rabbi’s devotion to her traditions and congregation, her inquisitiveness of other traditions–and science–her assimilating mind, and her honest and open expression of her desires, fears, and inner struggles. An interesting and refreshing read. In that sense, I say more power to you, Rabbi! May the ‘source’ be with you! Well… in my case, I might have chosen a path less forgiving. As I have commented on your blog before, I see a prophet as a varied mixture of being well meaning, delusional, and yes, a charlatan. I believe the Rabbi, along with others, is carving a new path. A much needed path. I (and probably many other Reform Jews) would look at the Old Testament prophets as the ancient equivalent of today’s social critics — that era’s version of Noam Chomsky, Gloria Steinem, Phil Ochs, MLK Jr., the scientist (I forget his name) who sounded the alarm about climate change, and so on. People viewing society from the outside and decrying its hypocrisies, inhumanities, moral failings. I would agree they are well meaning, as well as sometimes tactless, obsessive, annoying, self-righteous, unrealistic, uncompromising and probably horrible to live with. But I’m not sure I would call them charlatans. Of course there *are* other kinds of self-proclaimed prophets who are charlatans! Professing to cause miracles, cure the sick by laying on hands etc. But I don’t think the Old Testament prophets are that kind. They didn’t claim to do miracles, just spoke on God’s behalf berating the Israelites for not living up to their ideals. Yes, Ilana, there probably IS an aspect of social criticism in the work of monotheistic prophets. I do not mean to discount that, the potential value of that work, the benefit of some of the moral teachings, the social ‘organization’ that results from it. And I do not claim to know much about these prophets, let alone the one under whose influence I grew up, namely Mohammad. Yet, what does it mean when a prophet claims that they are channeling the words of God? That their text is God’s exact words? That they have received some tablets from God? That they have healed blind men or a leper etc.? Are they hearing a voice in their head and really believing it to be from God? Or are they thinking along the lines Rabbi Mates-Muchin indicates–“We all use God-talk to motivate people in different ways. You can use it responsibly”–in other words, I am well meaning, this is what these people believe in and want me to tell them, so it’s okay to tell a little lie, or talk in a vague way so they are happy and decent? Would large crowds have followed these prophets if they had said, “I have not directly heard from God–I’m just a social critic”? Or, “God may be speaking to me but I’m not really sure”? How are these prophets different from many ‘minor’ or ‘false’ ones that followed them with regards to this? Anyway, I don’t know very much and everyone is entitled to their beliefs. This is merely how I see it. This is a wonderful discussion that makes ne feel better about religion in general. At least in the abstract. It also reminds me of a moment in a Greek restaurant in Salt Lake City with Sam. We were ordering Greek wine and Greek hors d’oeuvres and this was apparently uncommon enough that the owner came over to see who his Greek guests were. I think Michael Dukakis was running for President and the owner thought it was cool that I was from Massachusetts. Somehow the conversation got around to religion–how could it not as we were all strangers in that Mormon land? The owner was astonished that Sam was Jewish, he acted like it was a new concept. Terrific interview. When I converted, Rabbi Mates-Muchin was in the Beit Din. It’s the candor but intense curiosity and sense of purpose among Jews that (in part) drew me to Judaism, and such a thoughtful, well-reasoned set of answers to your (terrific) questions made for an enjoyable read. Thank you!